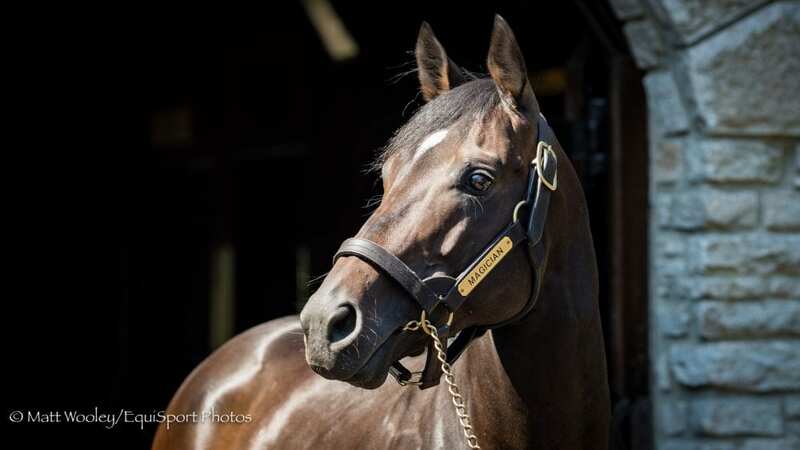 The Paulick Report is pleased to bring back a popular photo/video feature that will run periodically over the next few weeks and will spotlight stallions standing in Kentucky. This week's spotlight stallion is Magician, a 7-year-old son of Galileo that stands at Ashford Stud. Magician made his racing debut at age two, breaking his maiden going one-mile at the Curragh. The handsome colt blossomed at age three, taking the Group 3 Dee Stakes in his seasonal debut. He became a classic winner in his next start, winning the G1 Tattersalls Irish 2,000 Guineas by 3 1/2 lengths. After a subpar performance in the G1 St. James's Palace Stakes, Magician was given some time off. He returned to the races – and to the winner's circle – in November, when he charged to a half-length victory over The Fugue in the G1 Breeders' Cup Turf. Magician made six starts as a 4-year-old, winning the G3 Mooresbridge Stakes and finishing second in the G1 Tattersalls Gold Cup, G1 Prince of Wales's Stakes, and G1 Arlington Million. He retired with a record of 14 starts, 5 wins and 4 second-place finishes, for total earnings of $2,584,157. Magician entered stud in 2015 at Ashford Stud. His first crop are yearlings. This entry was posted in In The Stud, Videos and tagged aidan o'brien, ashford stud, breeders' cup turf, coolmore, coolmore america, galileo, Horse Racing, in the stud, Kerx, magician, thoroughbred by Paulick Report Staff. Bookmark the permalink.